Needle placed in Snickers bar. Deputies say a 12-year-old was hurt by one of the needles in a Snickers bar. On October 31, deputies responded to a report that a 12-year-old child had been injured with a sewing needle with eating a piece of candy. The child was trick-or-treating in the Grace Ridge subdivision, off Grace Church Road, in southeastern Rowan County. Deputies say the child had minor injuries from the needle that was inside of a "Snickers" bar. A search of the child's candy revealed a second needle in another "Snickers" bar. 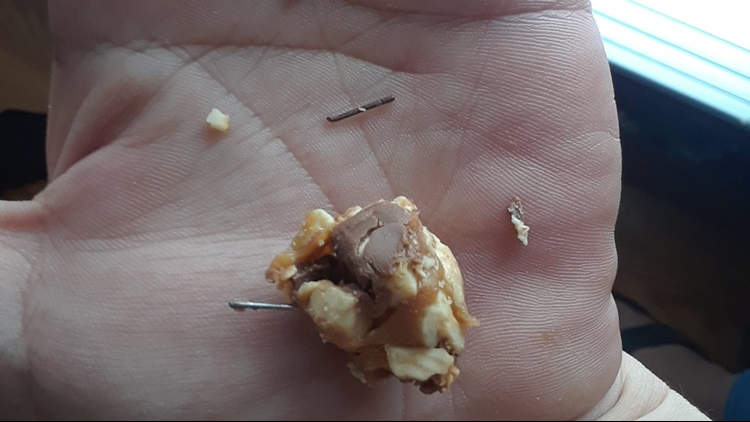 Deputies say on November 1, a second family reported finding a needle in a "Snickers" bar that their child received while trick-or-treating in the same Grace Ridge subdivision. Deputies collected numerous items of Trick or Treat candy from the neighborhood for examination, and did not find any other needles. Investigators developed a suspect through numerous interviews and charged the 11-year-old, who visits relatives in the Grace Ridge neighborhood. The needles were inserted into the candy through the wrappers and would be very difficult to detect, deputies said. The sheriff's office says the child has been sent for a mental evaluation before court proceedings begin.